Emerging Trends in Computer Science & Applied Computing is dedicated to facilitating increased opportunities for cross-fertilization across Computer Science and Applied Computing. Increasingly, computer science is the driving force for advances and breakthroughs in other fields. For example, experts in biology, political science, business, and national security, believe that their fields are no longer hypothesis driven – instead they are now data-driven disciplines. Virtually, all sub-fields of applied computing involve the use of computer science methods as building blocks to solve problems in different application domains. These sub-fields include: Monte Carlo methods and applications; Numerical methods and simulation; Quantum computing; Optimization and approximation methods; Probabilistic and randomized methodologies; Inversion problems; Ordinary, partial and stochastic differential equations; Finite element methods; Multi-level and Multi-grid methods; Operational research; Dynamical systems; Artificial Intelligence (AI); Social networks; Data and information mining; Semantic web and web services; Natural language processing; Biomedical science; Pattern recognition; Robotics; DNA computing; Machine learning; Telecommunications; Transportation systems; Game technologies; Engineering problems, as well as computational disciplines in geometry, biology and bioinformatics, chemistry, fluid dynamics, physics, mechanics, electromagnetics and electrodynamics, and numerous other emerging applications. 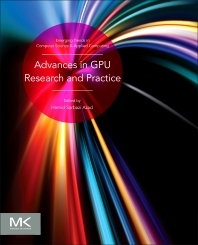 Advances in GPU Research and Practice focuses on research and practices in GPU based systems. The topics treated cover a range of issues, ranging from hardware and architectural issues, to high level issues, such as application systems, parallel programming, middleware, and power and energy issues. Divided into six parts, this edited volume provides the latest research on GPU computing. Part I: Architectural Solutions focuses on the architectural topics that improve on performance of GPUs, Part II: System Software discusses OS, compilers, libraries, programming environment, languages, and paradigms that are proposed and analyzed to help and support GPU programmers. Part III: Power and Reliability Issues covers different aspects of energy, power, and reliability concerns in GPUs. Part IV: Performance Analysis illustrates mathematical and analytical techniques to predict different performance metrics in GPUs. Part V: Algorithms presents how to design efficient algorithms and analyze their complexity for GPUs. Part VI: Applications and Related Topics provides use cases and examples of how GPUs are used across many sectors.